Put some structure into your life. Set your home or office apart with the elemental, intricate look of Asian design. Zen Door Service introduces the luxurious, logical appearance of shoji to your room, becoming an essential part of your interior treatment. Window and door shoji transform the quality of light, offering privacy and turning harsh light sources into a luminous softness. Let us combine your design with the best sliding or euro-hinge hardware in the business for smooth open/close performance. 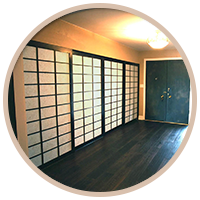 Based in Los Angeles, Zen Door has most recently made custom shoji for homes and offices in Ventura, Santa Barbara, Thousand Oaks, Venice, Lake Hollywood, Tarzana, Encino, Laguna Beach, Pasadena, Orange, Long Beach, Palm Springs and out-of-state clients as well. Zen offers you the broadest selection of laminated kozo paper, more design options, and more wood choices than our honorable competition. We offer you the broadest selection of laminated Kozo paper, more design options, and more wood choices than our honorable competition. Put some structure into your life. Contact John at Zen Door today. The founder of Zen Door came out of the special effects world and worked with prominent Los Angeles architects and designers. Operating independently since 2006, we have been helping homeowners, architects, interior designers, and contractors take their interiors to the next level. 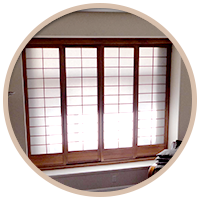 Whether for doors, windows, closets, or cabinets, our shoji lends an organic ambience to any room. 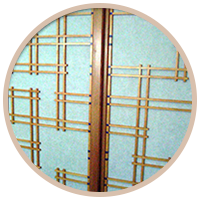 If you’re looking for affordable shoji doors in Los Angeles, California, contact us today. We offer an unparalleled selection of Kozo papers and woods as well as stains and finishes. 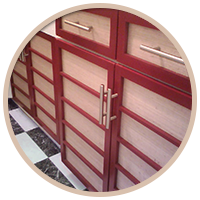 You get a customized product and professional installation. Let us combine your design with the best hardware in the business.